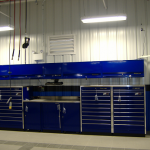 This color coordinated Honda store matched the hose reels, tool boxes and building trim in “Honda Blue” giving the shop an unmistakeable brand identity. 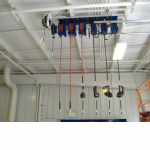 For efficiency they installed overhead reels for air, oil and electricity. ATF, coolant and an additional oil are available at filling stations throughout the shop. 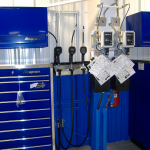 The dedicated oil change lanes get overhead reels for all the oils, air, ATF, coolant and washer fluid. 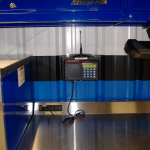 To track their valuable fluid inventory a wireless FIC system is installed. A record of every dispense is logged into a network database. Cusomized reports give details on dipsense by oil, technician, bay and date. To streamline the process each tech orders their own oil from a keypad mounted on the the toolbox. No more leaving the bay or waiting on the parts room to get oil. To help ensure every dispense gets billed a ticket is printed in the parts room when an oil dispense is completed. The parts room simply staples the ticket to the RO to make sure the oil gets billed.